01.08.2013*/France/ Pechereau/ Argenton-sur-Creuse - A training Mudry CAP 21 plane (F-GLOT) crashed after mid-air collision with Mudry CAP 10B (F-GUMI). The pilot of Mudry CAP 21 died. The CAP10B was able to land safely with minor damage. */Philippines/ Panabo City/ Kasilak village - A training Cessna plane crashed injuring the 2 occupants. */Guadeloupe/ La Desirade - A Zenith CH 650 Zodiac plane crashed into several coconut trees. */Australia/ east of Port Augusta/ Stirling North - A Lightwing GR-582 airplane (25-380) made an emergency landing injuring slightly the 2 occupants. 02,08.2013*/New Zealand/ Otago/ 5km south of Mt. Nicholas - A training Cessna 207A Stationair 8 II plane (ZK-LAW) crashed injuring seriously the 2 occupants. */Germany/ Emden airfield - A Brandli BX-2 Cherry airplane (PH-OOY) lost an engine power on approach and made a force landing in a field, but flipped over. The pilot received serious injuries. */US/ on Virginia's Eastern Shore/ 35 miles southeast of Chincoteague - Two Air National Guard F-16 fighter jets collided midair, forcing one of the pilots to eject into the ocean and be rescued by a Coast Guard helicopter a few hours later off the Virginia coast. The other pilot involved in the collision was able to fly back to Joint Base Andrews, Md. Both jets were from the 113th Wing D.C. Air National Guard and were on a routine training mission. */US/ MT/ Helena Regional Airport (KHLN) - A training Mooney M29F Executive 21 plane (N2926M) crashed on landing. No injuries. 03.08.2013*/Germany/ Baden-Wurttemberg/ Sauldorf - An ultralight biplane crashed. The pilot received fatal injuries. */Brazil/ SP/ Jundiai - A Beechcraft 58 Baron plane (PT-LKG) crashed shortly after takeoff killing all 4 occupants on board. */Russia/ Yaroslavl Oblast/ Borisoglebsky District - A trike crashed in a field killing the pilot. */US/ WI/ near Wild Rose Idlewild Airport (W23) - A Titan Tornado I aircraft (N70786) crashed due to an engine failure. The pilot received minor injuries. */Switzerland/ Sarnen/ Kagiswil - A training DG-1000S delta-glider (HB-3410) crashed into river, while performing an emergeny landing. The student pilot received minor injuries. */US/ TX/ Lago Vista/ Rusty Allen Airport (RYW/KRYW) - A Cessna R182 Skylane plane (N6370T) crashed on landing.The pilot received minor injuries. 04.08.2013*/US/ WA/ Stanwood/ Camano Island Airfield (13W) - A training Cessna 182P Skylane plane (N58437) crashed injuring a man and woman on board. */Spain/ Badajoz/ Pallares - An Eurocopter AS350 helicopter, engaged in fire fighting, rolled on its side, slightly injuring one of the pilots. */Germany/ Koblenz/ Mendig - A Pottier P50P aircraft (D-EDSB) crashed on landing. */US/ AK/ Katmai Nat'l Park/ Kamishak Bay - A Cessna U206F Super Skywagon plane (N5364Q) crashed on takeoff. No injuries. */US/ CA/ Gonzales - A Bell 206B JetRanger helicopter (N90146) force landed to a field, coming to rest on its side. */US/ PA/ Allentown/ Lehigh Valley Int'l Airport (KABE) - A Beech 58P Baron airplane (N4004S) made a belly landing. No injuries. */Czech Republic/ Pizen/ Domazlice - A Pipistrel Virus SW plane (D-MEKB) force landed, due to a storm and was damaged. Both occupants received minor injuries. */US/ WI/ Waushara County/ Springwater/ Wild Rose Airport - A 2006 Tornado I homebuilt plane crashed injuring the pilot. 05.08.2013*/Japan/ Okinawa/ Camp Hansen - A US military Sikorsky HH-60 Pave Hawk helicopter crashed injuring 1 of the occupants. */US/ TX/ 36 miles NE of Midland - Haverfield Aviation Hughes 369D helicopter (N8688F) flew into power lines killing 2 linemen. */US/ AK/ Pogo Mine - A Hughes 500D helicopter crash-landed into trees. No injuries. */US/ MN/ Eden Prairie/ Flying Cloud Airport - An Embraer Phenom 300 corporate jet overshot runway, crashed through a fence and ended up in the road. */Iceland/ 4,4 km (2.8 mls) NW of Akureyri Airport (AEY) - An ambulance Beechcraft B200 Super King Air plane (TF-MYX) crashed on approach killing 2, injuring slightly 1 of the crew-members. 06.08.2013*/Indonesia/ Gorontalo/ Jalaluddin Airport (GTO/WAMG) - Lion Air Boeing 737-8GP (WL) passenger plane (PK-LKH) struck a caw upon landing and overran the runway. */US/ NM/ Santa Teresa - An agricultural Piper PA-36-300 Pawnee Brave (N3789E) clipped a tree and crashed in a field. The pilot received minor injuries. */US. IA/ Vinton/ near Vinton Veterans Memorial Airpark (KVTI) - A Bell 47G-3B-1 helicopter (N83702) force landed to a field and was damaged. */Slovenia/ Mihalovec - An Evektor EV-97 Eurostar plane (S5-PCJ) crashed on takeoff injuring 1 of the two occupants on board. */Poland/ near Rybnik-Gotartowice airfield - A trike crashed in a wooded area killing the 2 occupants. */Canada/ BC/ west of Kamloops/ Cache Creek Hills - A training Cessna 172L Skyhawk plane (C-FQTR) crashed killing the student pilot. */Yemen/ Marib - Yemen Air Force Mi-8 helicopter shot down by Yemeni tribesmen. All 8 occupants on board were killed. */Russia/ Siberia/ Irkutsk region - A Robinson R-44 helicopter (RA-06302) crashed into a hill under poor visibility conditions. Both occupants were killed. */Switzerland/ Montbovon/ Kanton Freiburg - A Cameron Z-120 hot air balloon hit a power line on approach and crashed killing 1, injuring seriously the other 4 occupants. */Russia/ Nenets autonomous district/ Toboyskoye oil field - LUKOIL-Avia Mi-8 helicopter with 22 occupants on board crash-landed. No injuries. */Sudan/ South Darfur - UNAMID (Russian) Mi-8 helicopter made an emergency landing due to a technical failure. The 3 crew members (1 Sudanese and 2 Ukrainians) were arrested by rebels. 07.08.2013*/India/ Jharkhand/ Deogarh - A motor glider crashed shortly after takeoff injuring slightly the 2 occupants. 08.08.2013*/US/ AZ/ Tucson International Airport (KTUS) - A Cessna 310J plane (N3123L) experienced a collapse of the right main landing gear upon landing. */US/ WA/ Mount Vernon/ Burlington/ Skagit Regional Airport (KBVS) - A Commonwealth 185 Skyranger airplane (N67045) flipped over on landing. 09.08.2013*/US/ CT/ East Haven - A Rockwell 690B Turbo Commander plane (N13622) crashed into two houses on approach to (KHVN) killing 2 children. 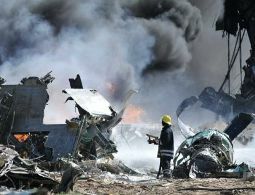 The 2 occupants on board of the aaircraft (former Microsoft executive and his teenage son) also died. The Soviet-made Antonov 24 plane got into trouble in the air and then missed the runway. The weapons most likely would have been destined for African Union or Somali troops, who continue to battle al-Qaida-linked militants from al-Shabab. 10.08.2013*/Russia/ Tyumen Oblast/ Yalutorovsk sport aerodrome - A Rotor R-16 BC-1 trike crashed killing the pilot. */Czech Republic/ Holesov Airfield (LKHO) - A F-4U Corsair scale replica (OK-SUR 11) crashed during an airshow killing the pilot. */Australia/ VIC/ Melbourne International Airport (YMML) - A standing at the gate Jetstar Airways Airbus A320-232 plane (VH-VGR) was hit by a Boeing 737-8FE (VH-YID) from Virgin Australia that was taxiing for take off. The plane was damaged. 11.08.2013*/Russia/ Samara Oblast/ Volga river/ Telyachiy Island - A training Yak-18 plane made a force landing in Volga river. No injuries. */US/ MD/ Dorchester County/ off Elliot Island - A Rans S-12 plane (N557BB) crashed into the water. No injuries. */US/ MA/ near Westport/ Adamsville Road/ Friends Airfield - A Quest Kodiak 100 plane (N10PZ) crashed shortly after takeoff injuring slightly the 5 occupants. */Germany/ Pottschutthohe airstrip - An ultralight crashed on takeoff. The pilot received minor injuries. */US/ IN/ DeKalb County/ near Waterloo - An ultralight crashed in a cornfield injuring the pilot. 12.08.2013*/US/ OR/ near Burns/ Calamity Butte - DEA McDonnell Douglas 369E helicopter (N62JP) force landed and was damaged. No injuries. */US/ AK/ Paxson - A Piper PA-18-150 Super Cub plane (N44RT) crashed due to an engine failure. The 2 occupants sustained minor injuries. */UK/ Northamptonshire/ near Canon Ashby House - A DeHavilland DH.60 Gipsy Moth plane (G-AAZG) crashed injuring the pilot and a boy (11) on board. 14.08.2013*/Germany/ Deining/ Lengenbachtal - A trike crashed killing the pilot. */US/ LA/ 30 miles southwest of Terrebonne Bay - A Bell-407 helicopter (N53LP) crashed in the Gulf of Mexico. The 3 occupants received minor injuries. */US/ NV/ west of Las Vegas/ near Mount Charleston - A Remos GX airplane (N110GX) crashed injuring slightly the pilot. 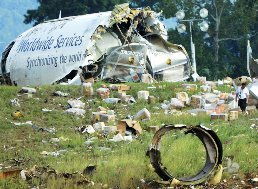 UPS Flight 1354, an Airbus A300F4-622R (N155UP) crashed and burst into flames near Birmingham-Shuttlesworth International Airport (BHM). Both pilots were killed. Flight 1354 departed Louisville International Airport, KY (SDF) about 05:04 hours EDT on a regular cargo service to Birmingham (BHM). The flight was on approach to runway 18 when it struck trees. The airplane crashed in a field, 1000 m short of the runway. Weather conditions in the area were rainy with low clouds. The flight recorders, or "black boxes," were feared to have been damaged since they were located in a section of the plane that had badly burned and smoldered for hours. 15.08.2013*/US/ AK/ Sleetmute/ near Sleetmute Airport (PASL) - A Cessna U206 Super Skywagon plane (N2141F) crashed in a wooded area during a test flight. The pilot received minor injuries. */Germany/ near Kulmbach Airport - A Duo Banjo ultralight plane (D-MJDB) sailed with the rescue parachute in a wooded area and got tangled up in trees. */US/ PA/ Harrisburg Int'l Airport (KMDT) - A Beech A36 Bonanza plane (N77DC) made a belly landing and was damaged. 16.08.2013*/Russia/ 26 km (16.3 mls) NW of Vilyuisk - Polyarnye Avialinii Antonov 2TP plane (RA-01419) made an emergency landing shortly after takeoff. The plane caught fire and was destroyed. */US/ Skydive Iowa - A passenger died after his parachute prematurely deployed during takeoff. */Canada/ Aylsham/ Canola field - An agricultural plane crashed. No injuries. */US/ MI/ Lake Michigan beach/ near Covert - A trike (N5157G) crashed injuring seriously the 2 occupants. */Canada/ AB/ 26km from Kananaskis Village - A Cessna 182M Skylane plane (C-GITE) force landed in a field due to an engine failure. No injuries. */Belgium/ Limburg/ Genk-Zwartberg Airport - A CASA 1-131E Jungmann plane (N131BK) crashed on takeoff injuring slightly the passenger. 17.08.2013*/US/ NY/ Canandaigua/ Canandaigua Lake - A Cessna A185F Skywagon plane (N185SB) flipped over on takeoff. No injuries. */UK/ Norfolk/ Felthorpe/ near Taverham Road - A Socata MS.893A Commodore 180 plane (G-AVVJ) crashed on approach injuring slightly the pilot. 18.08.2013*/US/ ID/ Kootenai County/ Cataldo - A Rand-Robinson KR-2 plane (N9028Q) crashed killing the pilot. */Russia/ Siberia/ Yakutia (Sakha)/ Aldan River - The Yak-52 plane (RF-00957) crashed while performing a loop at the Bereg Radosti (Shore of Joy) song festival some 10 kilometers from the town of Tommot. The pilot was killed. Two spectators who attended the event were injured. */Canada/ NS/ Lunenburg County/ Barss Corner - A training Kitfox V ultralight plane (N481CF) crashed killing the pilot. */US/ PA/ Lancaster Airport - A small plane crashed Saturday afternoon during Community Days at the Lancaster Airport. No injuries. */Brazil/ SP/ Ribeirao Preto/ Leite Lopes Airport (SBRP) - A small plane collapsed the nose gear on landing. No injuries. */US/ TX/ Dallas/ Addison Airport (KADS) - A training Cessna 172RG Cutlass plane (N4791V) made a belly landing. No injuries. */US/ AR/ near Texarkana - A Cirrus SR22T plane (N21HE) deployed the CAPS parachute following a loss of engine power and force landed to a field. */US/ OR/ Marion Forks/ Marion Lake - A Cessna 172B plane (N8141X) experienced a complete loss of engine power and force landed to Marion Lake in the Willamette National Forest. The aircraft sank. The four occupants onboard were not injured. */UK/ Popham EGHF - A standing Socata TB10 Tobago plane (G-GOLF) rolled down a slope and collided with a parked car. */Syria/ Masyaf Salma/ Lattakia - Syrian Air Force MiG fighter jet shot down by rebels. */Mexico/ Morelos/ La Proa - An ultralight plane crashed killing the 2 occupants. */Finland/ Helsinki-Malmi Airport (EFHF) - A training Cessna A152 Aerobat plane (OH-COX) collapsed the nose gear on landing. No injuries. */Germany/ Ampfing/ Ampfing-Waldkraiburg Airfield (EDNA) - A training Remos G3 Mirage 600 plane (D-MDFS) crashed on takeoff injuring seriously the 2 occupants on board. */Japan/ Ibaraki prefecture/ near Ami airfield - A Beechcraft A36 plane (JA4152) crashed on approach injuring the 4 occupants. */France/ Bourg en Bresse - A Robinson R22 Beta helicopter (F-GHHT) crash-landed due to an engine failure. No injuries. 19.08.2013*/US/ MT/ 170 miles southeast of Billings - USAF / 28th Bomb Wing B-1B Lancer bomber crashed. The 4 occupants ejected and received minor injuries. */Canada/ NT/ Yellowknife airport (CYZF) - Buffalo Airways Douglas DC-3C airplane (C-GWIR) caught fire shortly after takeoff, return to the departure airport and made a hard belly landing. The plane's damage is established as beyond economic repair. No injuries. */South Africa/ near Durbanville/ Fisantekraal Airfield - A gyrocopter crash-landed injuring 1 of the occupants. 20.08.2013*/US/ WY/ SW of Meeteetse/ Shoshone Nat'l Forest - A training Cessna R172E Skyhawk (N516MA) crashed. The student pilot received minor injuries. */UK/ North Wales/ Gwynedd/ near Pwllheli/ Rhydlios - A microlight aircraft crashed injuring slightly the 2 occupants. 21.08.2013*/Italy/ Casigliano di Acquasparta (Terni) - A Schleicher ASG 29 glider (D-9129) crashed on landing. */Brazil/ Sao Paulo City/ Marginal Tiete - An Eurocopter EC 120B Colibri helicopter (PR-IVE) made an emergency landing and it was damaged. No injuries. */Thailand/ 600 metres from Hua Hin aiport - A training Diamond DA40D Diamond Star TDI plane (HS-TPP) crashed. No injuries. */China/ Fuzhou/ Changle Airport - A fire alarm on a just-landed Shanghai-Fuzhou flight MF8542, Xiamen Airlines Boeing 737-75C jet (B-2659), triggered an emergency evacuation of its passengers, with 4 of them receiving minor injuries. 22.08.2013*/Tanzania/ Lake Manyara - Tanzania Air Services Beechcraft B200C Super King Air jet (5H-TZW) force landed in lake following a loss of engine power. Three of the 7 occupants sustained minor injuries. */Canada/ NT/ 13 km (8.1 mls) SE of Ivanhoe Lake - Transwest Air De Havilland Canada DHC-3T Vazar Turbine Otter plane (C-FSGD) crashed into a remote lake. There is no trace of the pilot. */Russia/ Udmurt Republic/ Zavyalovsky District/ near Bolshaya Wenya - A training TL-2000 Sting Carbon ultralight plane (RA-0568G) made a hard landing. The 2 occupants were injured. 23.08.2013*/UK/ Scotland/ Shetland Islands/ 2 nm W off Sumburgh/ Fitful Head - CHC Helicopter Eurocopter AS 332L2 Super Puma Mk2 carrying 18 people (16 oil workers and 2 crew) crashed into the sea off Scotland's Shetland islands. Four passengers were killed, 3 men and a woman. */US/ MO/ Christian County/ SE of Ozark/ Gimlin Field - An experimental aircraft crash-landed. */US/ CA/ Sacramento/ Bing Maloney Golf Course - A Piper PA-28-180 Cherokee plane (N8223W) crashed shortly after takeoff injuring the 2 occupants. */Germany/ Gunzenhausen-Reutberg Airfield (EDMH) - A training Piper PA-28-181 Archer II plane (D-EILG) veered off the runway on landing and crashed injuring slightly the 2 occupants. */Sweden/ Skelleftea kommun/ Fallfors - A Bell 47G-1/2 helicopter (SE-HEO) made a hard landing, caught fire and burned out completely. The pilot was taken to the hospital with fractures, neck injury and burns while the passenger had only minor injuries. */US/ FL/ Venice/ Venice Municipal Airport (KVNC) - A Beech G33 Bonanza plane (N48JL) made a belly landing. 24.08.2013*/US/ AK/ Anchorage/ Merrill Field Airport (PAMR) - A Cessna 150L airplane (N18699) crashed shortly after takeoff killing the 2 occupants. */Germany/ Aicach-Friedberg - A Cessna F152 plane (D-EFTO) crash-landed on a field. */Netherlands/ Midden-Zeeland Airfield (EHMZ) - A Cessna F172N Skyhawk plane (PH-ATW) hit the fence at the end of the runway on landing. */Germany/ Biberach district/ Tannheim - An Udet U-12 Flamingo biplane tried to take off, which did not succeed. The biplane grazed a parked light plane, a Diamond HK.36 Super Dimona (D-KKCN), which tail broke off, and injured three people on the ground, one of them sustained serious injuries. 25.08.2013*/US/ MA/ Taunton/ near Taunton Municipal Airport - King Field (KTAN) - An Aeronca 7AC Champion plane (N83863) crashed on takeoff killing the 2 aboard. */US/ TX/ Waco/ McGregor Executive Airport - A biplane crashed on takeoff when the right brake locked up. No injuries. */US/ NY/ Cortland/ Cortland County Airport-Chase Field (N03) - A Vans RV-7A plane (N411AK) collapsed the landing gear on landing and flipped over. The sole pilot on board received minor injuries. */US/ NY/ Shelter Island/ Klenawicus Airfield - A Cessna 172R Skyhawk plane (N392ES) overran the runway on landing and crashed injuring slightly the 3 occupants. */Somalia/ Guriceel - One person was reportedly injured after an Antonov 26B-100 plane (EK-26818) carrying a delegation led by the Deputy Chief of Somali Military forces Gen. Abdirizak Khalif Elmi lost a wheel upon landing at Guricel Airstrip in Galgaduud region of central Somalia. 26.08.2013*/Sweden/ Stockholms lan/ Tyreso-Flaten - A Robinson R44 helicopter crashed into the lake. No injuries. 27.08.2013*/Switzerland/ near Sarnen/ Ramersberg - A Piper PA-28R-201 Arrow III airplane (HB-PDC) impacted a wooded hillside killing a passenger and seriously injuring the pilot. */UK/ Isle of Wight/Sandown Airport (EGHN) - A Rans S-6ESD Coyote II plane (G-MYUZ) crashed on landing. */US/ HI/ near Wheeler Army Airfield - An agricultural helicopter crashed in an Oahu pineapple field injuring both occupaants. */US/ MD/ west Chestertown/ Breezecroft Airport (05MD) - A Cessna 150L plane (N1574Q) flipped over during takeoff. No injuries. 28.08.2013*/US/ AZ/ Tonto National Forest/ 20 miles west of Payson - A Bell 206 L-1 helicopter (N2018R) made a hard landing injuring 1 of the 6 occupnats on board. */US/ KS/ Emporia - A Challenger ultralight plane crashed in a creek injuring the pilot. */Australia/ NSW/ east of Gloucester - A Hornet STOL ultralight aircraft (19-8251) force landed to a paddock injuring slightly the pilot. 29.08.2013*/Canada/ AB/ Medicine Hat Airport (CYXH) - A Cessna 172N Skyhawk plane (C-GSKZ) crashed on takeoff injuring slightly the pilot. */US/ MI/ Oceana County/ Grant Township - A Brantly B-2B helicopter (N2253U) crashed shortly after takeoff injuring slightly the 2 occupants. */Canada/ ON/ north of Kingston/ Loughborough Lake - A floatplane, experienced an apparent gear-down landing on Loughborough Lake. The aircraft came to rest inverted. No injuries. 30.08.2013*/US/ ME/ Limington/ near Limington-Harmon Airport (63B) - A training Cessna 172 Skyhawk plane (N8063B) crashed on takeoff killing the student pilot. */US/ CA/ Rancho Palos Verdes/ near Trump Golf Course - A Piper PA-18-105 Special plane (N224T) went down on a beach and came to rest upside down. The sole pilot onboard the aircraft received minor injuries. */US/ MI/ Wilderness State Park - A glider crashed injuring the pilot. */US/ NC/ Apex - A Cessna 172E Skyhawk plane (N3513S) crashed on landing ran out of the runway and flipped over. No injuries. */Russia/ Vladimirskaya oblast/ Alexandrov/ Dar'ino - An unregistered Agro-02 homebuilt airplane crashed injuring the pilot. */Hong Kong - Thai Airways International Airbus A380-841 (HS-TUA), Flight TG600 from Bangkok to Hong Kong, ran into heavy air turbulence during descent. About 20 passengers who had not yet fastened their belts were injured. One flight attendant suffered a broken collarbone. */Ecuador/ Morona-Santiago/ Macas/ near Edmundo Carvajal Airport (SEMC) - A Piper PA-32-300 (HC-BOD) crashed on approach injuring the 7 occupants. */US/ NH/ Stinson Lake in Rumney - A training Cessna U206F Stationair plane (N208LH) flipped over on landing. No injuries. */US/ MS/ Mc Comb/ near McComb (Pike County) Airport (KMCB - A Cessna 1722L Skylane plane (N7892G) crashed on approach injuring slightly the pilot. 31.08.2013*/US/ AK/ Tatitna/ near Tatitna Airport (8KA) - A Piper PA-18A Super Cub plane (N4581A) crashed shortly after takeoff killing the pilot, injuring slightly the passenger. */Canada/ MB/ Between Louise Lake and Lulu Lake/ north of Kenora - A Cessna 182A Skylane floatplane (C-GKEI) experienced a loss of engine power shortly after takeoff and force landed to wooded terrain injuring slightly the 2 occupants. */US/ NM/ near Truth or Consequences - A helicopter crashed killing the 3 occupants. */Switzerland/ Dittingen Airport (LSPD) - A 1919 Thulin A/Bleriot XI airplane (SE-AMZ) was participating at the Dittinger Flugtage (Airshow) when it lost height shortly after takeoff. No injuries. */US/ OR/ Scappoose Industrial Airpark (KSPB) - A training gyrocopter crashed killing the pilot. */Italy/ near Treviso/ Spresiano - A Piper PA-28 airplane crashed on takeoff injuring the pilot.